Fat happens. It can happen to anyone. And once it happens, it's hell's own game to get rid of it again. But why are we all putting on weight? And what can we do about it? 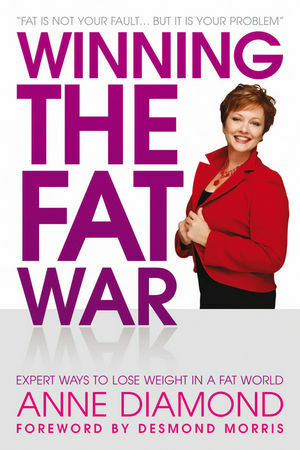 Winning the Fat War is Anne Diamond's heartfelt and revealing insight into the world-wide weight epidemic. She feels passionate about the subject because she's been there and back. Following her own much publicised battle with weight, Anne underwent gastric surgery as a last resort. Her shocking experience will, she hopes, be a warning to others. There is a link between obesity and impotence! Thin people can be fat - on the inside! Men are better at slimming than women, but they often have more of the most dangerous kind of fat! Scientists are working on a daily injection to finally beat fat. It's already started 'human trials'. Anne Diamond's Winning the Fat War includes the views of Desmond Morris, Bill Clinton, leading politicians, global medical experts and stories of many who have suffered victimisation simply because of their size. Ground-breaking, candid and bravely written - this book challenges 'fattist' prejudice and will change attitudes to fat forever. Anne Diamond is one of Britain's best known TV stars; her highs and lows have been followed by millions - and her highly publicised battle with her weight is one of the cornerstones of her popular appeal. In the 1980s, as a star of breakfast television, the 'elfin queen' was watched by 14 million people daily. In the 1990s they moved with her to 'Good Morning With Anne and Nick' and followed her story as she became mother to five children, and spearheaded the famous 'Back To Sleep' crusade to cut cot death (still the UK's most successful health campaign ever), and through her highly public divorce. These people have since grown up (and out! ), and had families too. Anne has also had a much publicised battle with weight gain. She chose to undergo weight loss surgery, both in Belgium and in the UK. It did not prove the easy solution she hoped for - but it did arm her with a wealth of experience and insight into the obesity revolution. Millions still identify with Anne, because 'fat happens'. One in four women and one in five men are suffering as Anne has done. Becoming a 'famous fattie' taught Anne a lesson she will never forget, and she is determined that the lessons she learned will change society's attitudes. See her enormously-successful online support & networking site: www.buddypower.com. 1. Fat is a four-letter word. 2. Appearances can be deceptive. 3. Is there really an obesity epidemic? Why the naked ape has become obese. 4. The fat difference between men and women. Bill Clinton and childhood obesity. 5. Fat kids make fat adults. 6. The psychology of fat.